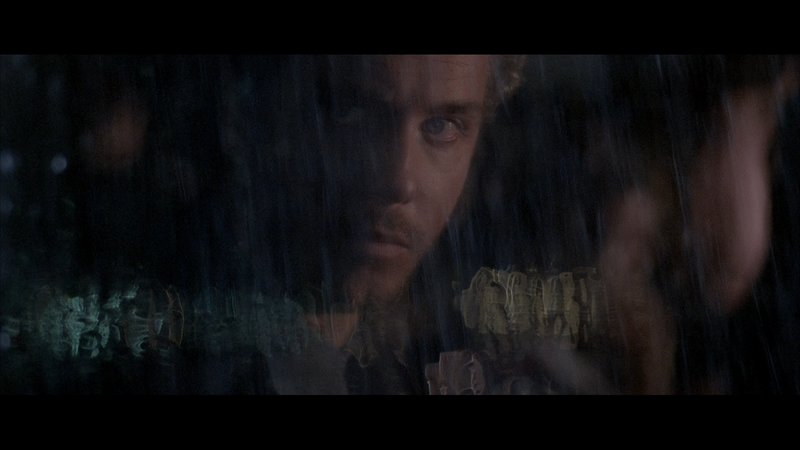 Manhunter is probably one of the better psychological thrillers and a tad underrated especially for a film of the ‘80s and while there are plenty of elements from that era (look no further than the electronica score) but the performances are so dang compelling led by William Petersen and Tom Noonan. Plot Synopsis: Former FBI profiler Will Graham (WILLIAM PETERSEN) reluctantly returns to his old job to track a horrific serial killer known as “The Tooth Fairy” (TOM NOONAN). But in order to get into the mind of this maniac, Graham must face another: Hannibal Lecktor (BRIAN COX), the imprisoned psychiatrist whose own insanity almost cost Graham his life… and whose insights into “The Tooth Fairy” could prove as dangerous as the killer himself. Quick Hit Review: Michael Mann’s Manhunter, the movie based on Thomas Harris’ novel, “Red Dragon,” is our official first glimpse at Hannibal Lecktor though in popular media, and general audiences, would later recognize Anthony Hopkins portrayal in The Silence of the Lambs, is one hell of a psychological thriller that features top notch acting from then newcomer William Petersen, Brian Cox as Lecktor and Tom Noonan playing Francis Dollarhyde and while Noonan can’t hold a candle to Ted Levine in Lambs, he makes for one creepy fella yet shows some depth than just being some generic serial killer. 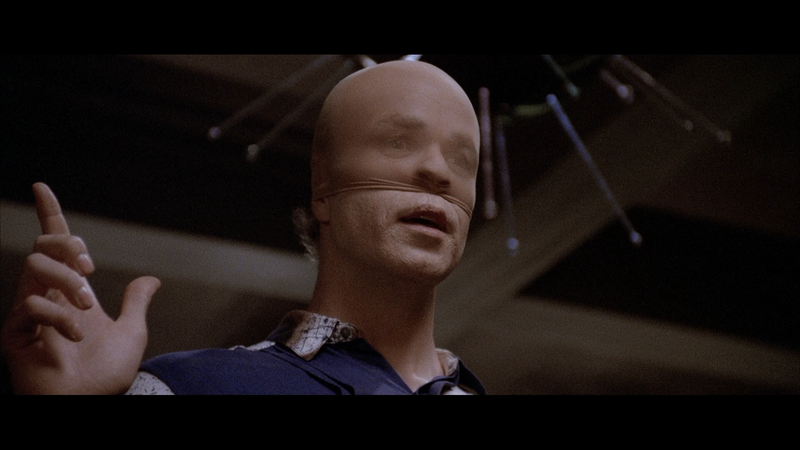 I know some prefer Manhunter over its successor Silence of the Lambs but I probably place the latter slightly above it. That being said, it’s a well made thriller that doesn’t rely on explosions or even spoon-feeding its viewers and instead focuses on character, primarily that of Graham as he falls deeper into a world he once left behind (by necessity more so than choice). Petersen shows off perhaps some of his best acting in his career, though To Live and Die in L.A. isn’t far behind until the early years of “CSI” when it wasn’t complacent it formula. For Michael Mann, he already showed skill with Thief and seemed to hone in for Manhunter and for any other filmmaker, he could’ve easily just done the same thing over and over again and instead he tries different things and in 1995 it culminated with his best movie to date, Heat while The Insider was probably my second favorite movie with Manhunter coming in third. Still, Manhunter is his most visually compelling film and in conjunction with a great 1980s soundtrack, it’s probably one of his more memorable movies on his resume. This “Collector’s Edition” release comes with a matted slip cover. The inner cover is reversible displaying the original poster artwork. There are four new interviews under The Making of Manhunter: The Mind of Madness (18:16; HD) is an interview with star William Petersen; Courting a Killer (15:54; HD) features actor Joan Allen; Francis is Gone Forever (22:03; HD) offers Tom Noonan’s thoughts on his character; and The Eye of the Storm (35:56; HD) finds Director of Photography Dante Spinotti discussing the movie. 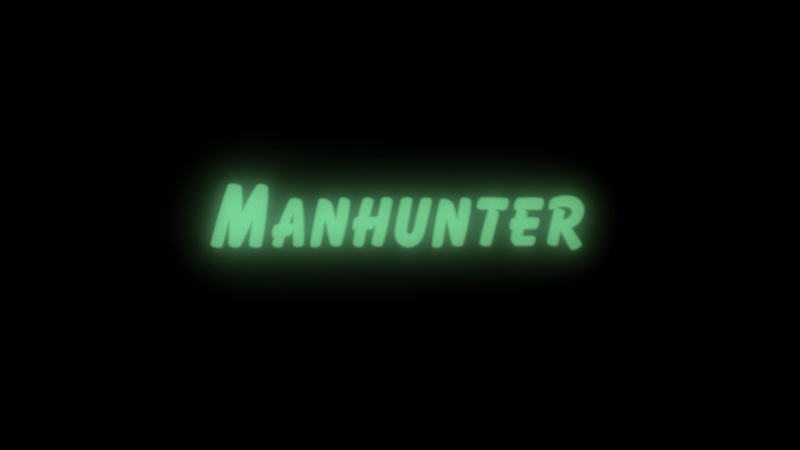 The Music of Manhunter (42:22; HD) is a collection of interviews with composer Michel Rubini, Barry Andrews (Shiekback), Gary Putnam (The Prime Movers), Rick Shaffer (The Reds), and Gene Stashuk (Red 7). This is probably one of the more fascinating features as we get an in-depth look at some of the iconic score and soundtrack on the movie. The First Lecktor (40:29; HD) has actor Brian Cox answering a variety of questions about his career, how he got the role and about the iconic character. Rounding out the disc is the Theatrical Trailer (2:05; HD) and a Still Gallery. Now, this is an interesting inclusion. The disc has the Director’s Cut in High-Definition with some standard definition inserts. Presumably this is the best we’ll ever see this version of the film in… However, my personal preference always resides with the Theatrical Cut though there are some interesting differences between the two. 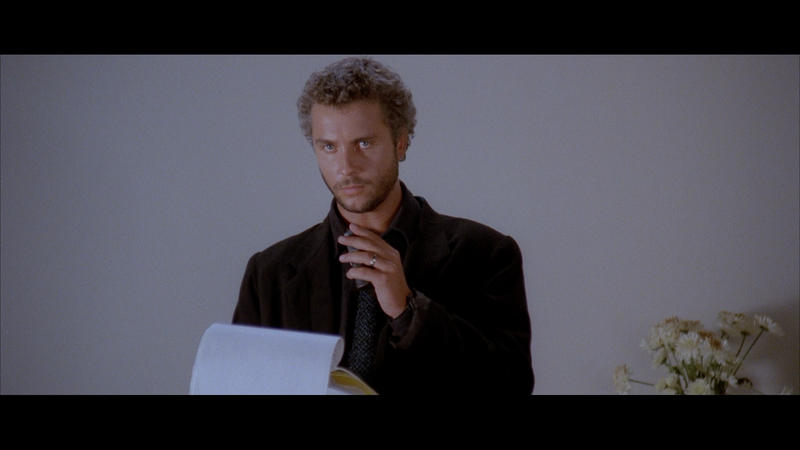 The Manhunter Look (10:04; SD) is a conversation with Spinotti, I’m guessing filmed for the last MGM DVD release. 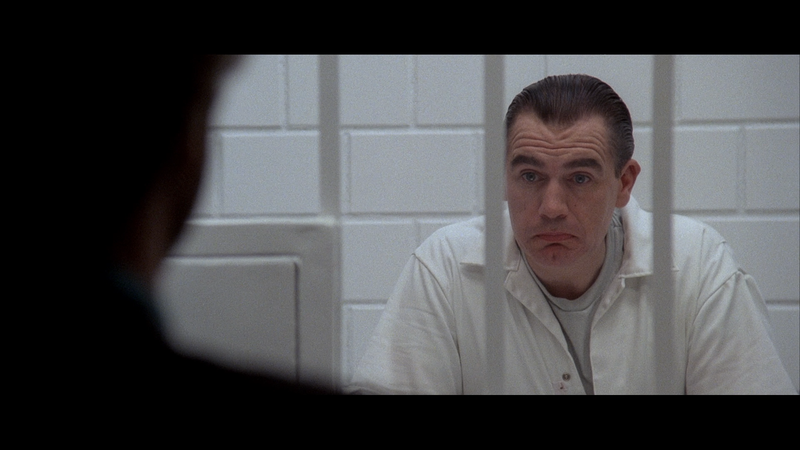 Inside Manhunter (17:17; SD) is a collection of archive interviews with Petersen, Allen, Cox and Noonan. Audio Commentary – Writer/Director Michael Mann gives his thoughts on the DC, some of the changes from the TC and other observations. It can be a tad dry but still Mann provides some interesting info about the project. Manhunter makes another appearance on Blu-ray (the last through MGM) and while I can’t compare, the one through Shout’s Scream Factory line looks gorgeous. The 1080p high-def transfer (MPEG-4 AVC codec) has all the vibrant colors one would expect from a 1980s Michael Mann production (like “Miami Vice”). The nice thing is, even with the bright colors detail is never lost. There is some natural film grain but otherwise it’s a fantastic looking transfer though I did notice some minor instances of dust marks but while it’s not pristine, it’s still a transfer that looks fantastic. Both cuts come with a DTS-HD Master Audio 5.1 (and 2.0) track and all throughout its nicely balanced providing clear dialogue levels while also giving off some good depth with the front and center channels showing off the main elements while rear speakers are used for any ambient noise but especially for the amazing score (by Michel Rubini) and 1980s soundtrack. 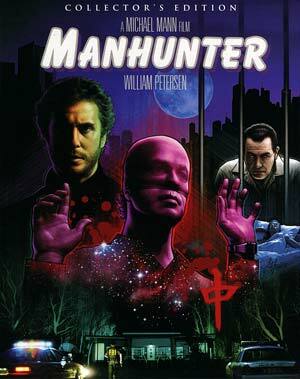 Overall, Manhunter is probably one of the better psychological thrillers and a tad underrated especially for a film of the ‘80s and while there are plenty of elements from that era (look no further than the electronica score) but the performances are so dang compelling led by William Petersen and Tom Noonan with honorable mention to Brian Cox playing the role of Hannibal Lecktor that was understated and refined. This “Collector’s Edition” Blu-ray release by Shout Factory offers great video and audio transfers and a solid selection of bonus material, both old and new.